When Amanda and Stacia announced the theme for this week's linky I was so excited and knew the book that I wanted to share. But then I forgot to bring the book and art activity home for the weekend. So I decided to wait to post till tonight after getting all my materials together, only I don't have a sample!!!!! Be sure to head over to their blog for some amazing books and ideas. This tale cleverly illustrates the saying too much of a good thing. After five brothers accidentally scatter pumpkin seeds over a small town, they feel responsible when pumpkins and vines begin to overrun the houses the next year. The boys secretly try to make things right and are rewarded with delicious watermelons for their efforts. The story's open ending could initiate an amusing writing project. The collagelike, colorful computer-generated illustrations, featuring the siblings in denim overalls and patterned shirts, are clever and entertaining. 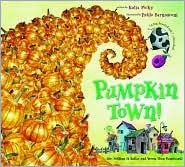 A good fall read-aloud, especially for those wanting to avoid Halloween-themed books. I love the illustrations in this book!! I love the silly story and I do love the open ending - watermelon seeds!! I use this book as a jumping off point for an art lesson on perspective. Students draw a horizon line that is a hill (the boys live above the town). They fill the sky with torn paper. I give them a clipart house to put at the top of the hill. Then they fill they hill with pumpkins. Small near the house, medium in the middle and large near the bottom corner. I give them some clipart pumpkins and a variety of scrapbook papers to make their pumpkins to get a collage effect like in the book. Here are the sad samples I was able to find - that is my art that I did with the students as a demo and some examples of the clipart and paper we use. Sorry no finished product - but they are sooo cute!! This is also a great book for me since around this time we are usually doing some mapping skills and we create our own towns - pumpkin town, watermelon town, chocolate town etc.! As the description said it is a great writing prompt for what happens next with the watermelon seeds. Thanks for sharing this book! I am with you, I love doing festive books, but don't want to get too "halloween-y." This seems just right! I already added this book to my list of books to check out. It looks like SO much fun!